owls about that then! : Close views, site 218. Glorious sunshine earlier in the week allowed for a very rare opportunity to get some owl images in brilliant light, makes a change I suppose as I am all too quick to complain if the conditions are poor. This particular owl (at my site No 218) doesn't take kindly to cars stopping within the confines of his territory and more often than not comes for a closer look, he's quite an inquisitive guy! He seems to have three or four favourite perches with the bright yellow footpath way-marker being one of them. After I'd captured a few shots of him from distance I chanced my arm and shuffled the car back and forth to get closer, oh he was having none of that and flew to another perch only a few feet further away, there was now a Hawthorne bush between us but he continued to watch me through the gaps. A quick change over to manual focus and I was still able to capture him giving me the stare. For the next five minutes he sat quietly assessing the situation, he couldn't see me as I was obscured by my camo screen. I think that once he realised there was no threat it was OK for him to return to another of his favoured perches. I'd seen him on this particular gate post before but never managed an image, the car was always at the wrong angle. I have "a thing" for images of owls with dark backgrounds, (don't ask me why, I don't know?) but I do know that I was very pleased he landed on it as these next two images are easy my favourites from this session. He bobbed and weaved his head from side to side in that characteristic way that owls do checking that the coast was clear, once satisfied all was OK he returned back to his favoured "yellow post". He was now very close, and the next two images are full frame shots taken at a focal length of 300mm. And finally just for good measures, the owl duly obliged by landing on the footpath sign again that I captured him on during my last visit. Only this time I managed to zoom out enough (120mm) to get all of him and the sign in the frame, thanks owl! I reckon on dark backgrounds it gives a nice contrasting colour to the owl, love the full framers, great detail and them talons! Beautiful images Paul - every one! I agree with your preference for the dark background - somehow it makes the setting look more natural. Great stuff! Great images you are very lucky to have so many sites in your area. 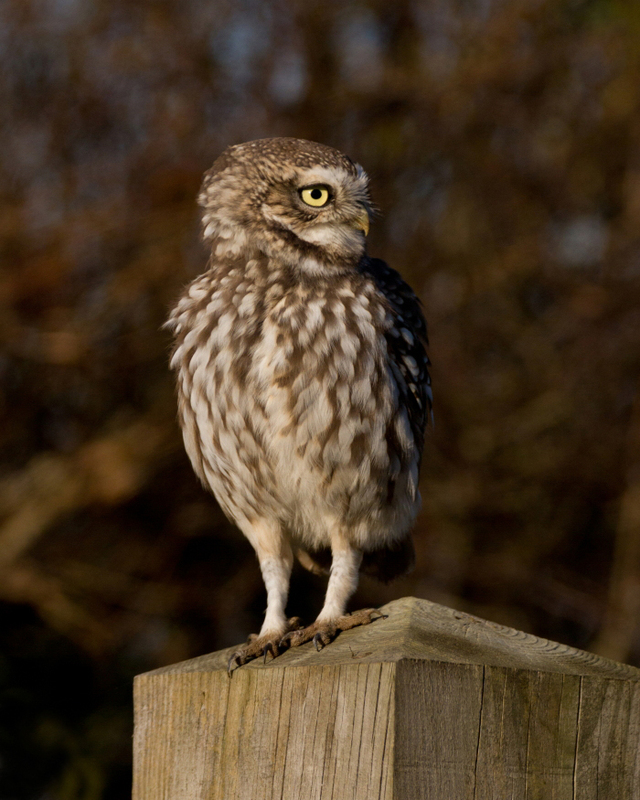 there used to be only one site for Little Owls here but they have not been seen for around 5 years now. Owls are very interesting and intelligent birds. Thanks for posting this information about this bird and the images are impressive. You are able to take just the right clicks.